1 - The hockey gods dropped in on Calgary last night. Brad Marchand scored his league-leading 36th goal of the season as his Boston Bruins downed the Calgary Flames 5-2. It snapped the Flames' win streak at 10 games, and denied them a franchise record. Funny how the hockey gods work; this year's Flames were just good enough to tie the 1978-79 Atlanta Flames for consecutive wins, but not better them. Sort of like the football gods who allowed Chris Milo to tie Dave Ridgway in 2013 with 28 consecutive field goals, or Kory Sheets to tie George Reed for most 100 yard rushing games in a season. The gods are stubbon buggers, but open-minded. 2 - The 1978-79 Atlanta Flames played at the Omni and their roster boasted Willi Plett, Guy Chouinard, Bob MacMillan, Tom Lysiak and Rejean Lemelin. Funny that team won 41 games that year, because I remember the Atlanta Flames as being mostly crappy, and that's what forced their move to Calgary in 1980. 3 - In the Media/NHL scouts room before last night's Pats game, someone mentioned that Brad Marchand had "really come into his own this season". I countered that the diminutive forward was the biggest reason the Boston Bruins won the Stanley Cup in 2011. He came into his own a very long time ago. 4 - I'm starting to think the Montreal Canadiens will win the Stanley Cup in 2017, with the same coach as the 2011 Bruins. 5 - During our live SportsCage radio broadcast on the concourse at the Pats game yesterday, some fan tried to steal my Game Notes and roster. At Rider games, I give my Mom one of the team-issued depth charts and roster before every game but she's almost assaulted and mugged by the time she gets to her seat with it. Before I die, I vow to get the Pats and Roughriders selling programs WITH LINEUPS again. 6 - What's going on at the Brandt Centre right now is pins and needles stuff. At least it is for me, and anyone else around here who gets their kicks from junior hockey. The hair on my neck raised last night when I read former Pats broadcaster Kevin Gallant's recollection of the 1980-81 Regina Pats (a few posts below this one), the team which set a record with 49 wins, and saw it fall last night. Jock Callander, Bob Strumm, Garth Butcher, Barry Trotz, and their WHL nemeses Mike Vernon and Grant Fuhr ... THOSE WERE THE GREATS! And this year's Pats team has eclipsed some of them. Head-spinning stuff. 7 - As I sat in the Best Western Seven Oaks luxury suite last night (thanks to them for that by the way), I was thinking of who on this team I enjoy watching the most: Sam Steel, Connor Hobbs, Adam Brooks, Dawson Leedahl, Nick Henry, Tyler Brown ... the list is endless! It's not like those two-player Pats teams we watched for so many years in the Agridome. We're watching this group make history right in front of our eyes. Wickenheiser, Gillies, Staniowski, Hicke ... those guys' names are in the rafters because they won something here. The opportunity lays out before these current kids and it's spine-tingling to watch night-after-night. 8 - Access Communications has put some billboards up around town advertising our playoff television coverage for the Regina Pats this spring. It's not 100% confirmed yet, but it looks like we'll be carrying each and every game - home and road - through the playoffs right up to the WHL Final if the Pats make it that far. Bringing the Pats into peoples' homes all across Saskatchewan on Access is going to make these players absolute heroes in the 306 provided the Pats pick up their end of the bargain. Right now, there's no reason to think they won't. John Paddock has turned out to be a total guru. 9 - A lot of silence out of New Mosaic Stadium this week other than the club's announcement that they're dipping into their Waiting List to start selling season tickets for the first time in three years. It's not that the club is hurting for season ticket sales (they're at 25,000) but they just figured now's the time to open it up. If you're on the Waiting List, expect a call or an email from the club soon. 10 - The news of the arrest of former Roughrider lineman Tre'von Armstead in Las Vegas Monday night appeared briefly on this website yesterday, then was taken down. That had nothing to do with any communication from the Roughriders, who elected not to sign Armstead after the 2016 season. And the arrest should in no way reflect negatively on the Green & White. The 22-year old Armstead came to the Riders after a troubled stint at Baylor and it was a case of Chris Jones allowing Armstead a second chance at football, and life. But the kid blew it. And I deleted the post after people close to Tre'von pleaded for his privacy while he deals with this matter. "He's turning his life around," said one person. No he's not, and that's why he's facing charges in Las Vegas. 11 - Mark's CFL Week is less than a week away and there's starting to be some hype about it in the Queen City. I think a lot of you will be relying on this website and the SportsCage for coverage of the event if you're not able to join us. The complete schedule of events is at www.markscflweek.ca and the creme de la creme of the week is the Canadian Football Hall of Fame VIP Gala next Wednesday at New Mosaic Stadium. Tickets for the event are $250 and you'll be able to rub shoulders with the likes of Damon Allen, George Reed, Eddie Davis, Gene Makowsky and other Hall of Famers. It was slipped that this year's CFHOF induction class - who will be introduced at the event - will likely include Anthony Calvillo and Geroy Simon, meaning they'd be in attendance next week. After perusing the ballot of elligible builders and players, I noticed Jim Hopson's name. I certainly hope Jim gets in this year, but I'm not sure that's in the cards just yet. Roy Shivers is on the ballot as well, meaning he's been nominated by someone. 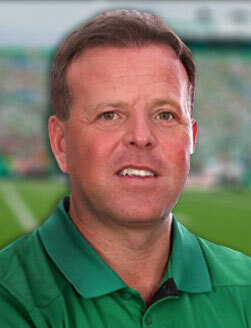 12 - Many have wondered why Kent Austin hasn't been inducted into the CFHOF yet. Strangely, for some reason, I was positive that he was but I was wrong. Again, after inspecting the Hall of Fame ballot, Kent's name isn't on it which means no one's nominated him yet. The entire CFHOF ballot is at www.cfhof.ca. 13 - For just the second time ever, I think I'll break down today and fill out an NCAA March Madness bracket. Former Rider Chris Best is running a Bracket Challenge benefitting the Childrens Hospital Foundation and that's as good of a cause as any. However like most of my friends, I have NO idea what I'll be doing. It will be like filling out the numbers of a 6-49 ticket. But if you're entering, good luck! I almost spit my coffee out of my mouth... the Habs are going to win the Stanley Cup lmao. I had to read that 4 times to make sure I was seeing what I thought I was seeing. #9 The Riders selling season tickets to people on the waiting list. Couple that with Roy Shivers on the ballot for the HOF. Two good chuckles right there. While I would love to see the Habs win I have serious doubts. I've been their fan since the original six and while many I know switched to the Oilers in their time I never did. I do now however cheer for them when they don't play the Habs and I'll even cheer for Calgary when they don't play Habs or Oilers. I was disappointed that Calgary's streak was broken and really hope we have some serious Canadian threat for the playoffs. Some tough competition there however! Did you see the Habs against the Blackhawks on Tuesday night? They won't get out of the first round, even with Carey Price. Let's hope the Pats don't play Calgary in the first round the Hitmen are looking like a team that could upset. Mr. Roy Shivers is a continuous astute football executive with a excellent reputation of high quality player recruitment. He was personally responsible for building the Saskatchewan Roughriders Football Club from the ashes of ruin back to a high standard professional sports entity that many are now riding their coattails on, past, present, future. Thank you Mr. Roy Shivers for your contributions by resetting the high bar of respectability to the franchise..
MMQB article asserts that Kaepernick and RG3 are done as far as NFL careers go. One would have to think that the Argos could see one of these guys start in a year or two. Habs chances of winning the Stanley Cup are every bit as good as the Patsies winning the Memorial Cup. Playoff hockey is no comparison to regular season hockey and whoever has the hottest goalie usualy has a chance to move on. From what I have read on here all year most of the Patsies fans have bitched about their goalies a lot lately . Should be interesting .Go Habs Go.